If you were to judge my eating habits based solely on the items I have thus far provided you on my blog, you would probably think I only eat noodles and pastries. Maybe they are healthified versions of their notorious traditional counterparts, but even so, my average blog post may well peg me as an extravagant eater. I do love to bake, and making pasta a less sinful treat is a favorite exploit of mine, but if that was all – or even a good part – of what I ate on a regular basis, I probably wouldn’t even have the energy to think up new recipes in the first place, weighed down by all the carby overload. After all, one cannot live on carbs alone. Having the right balance of nutrients is what keeps me going through the multiple group fitness classes I teach daily, and keep up with personal training sessions I give in the early mornings. Okay, let’s just be honest. I’m really excited about this recipe. This one isn’t super fancy, not dinner-party worthy or overly decadent, but it is my absolutely favorite kind of lunch. (Or sometimes breakfast or dinner!) I like how simply yummy this little parfait is, as much as I like its impressive nutritional resume. A note on my beloved Greek yogurt. Because I personally think it’s better to add - and therefore have control over - your own sugar to yogurt, rather than buy the kinds with truckloads of sugar and artificial flavors, I always buy the nonfat plain Greek yogurt with a supershort ingredient list. That way I can flavor it with my own vanilla, cinnamon, or honey, and top it with fresh fruit however I like, and I can keep the added calories and other junk to a minimum. And because Greek yogurt is thicker and has much more protein than regular yogurt, it makes a much more satiating parfait. If you’re not used to the intense tang of plain Greek yogurt, I recommend adding that little bit of natural sweetener at first. 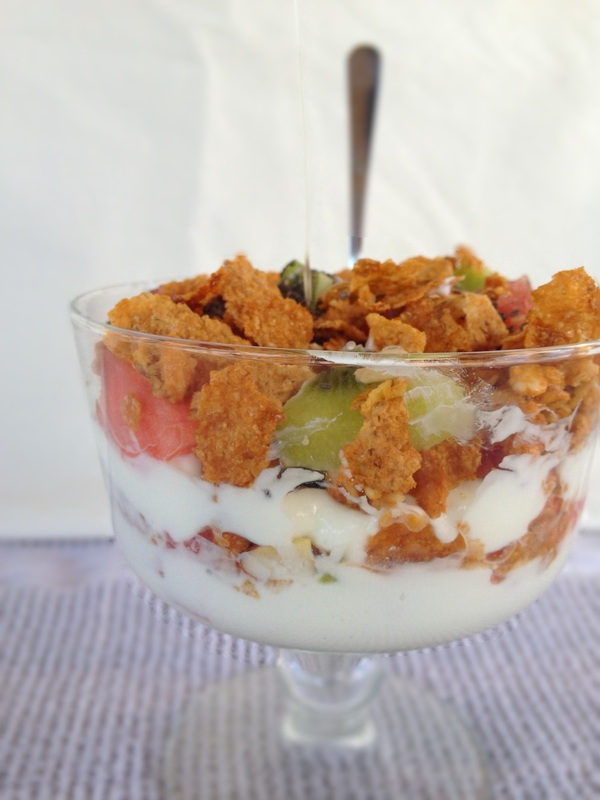 You’ll want two glass bowls or stout drinking glasses so that you can see the layers of your pretty parfait. Start by carefully spooning the first layer of yogurt down and smoothing it out without getting yogurt all over the sides of the glasses. 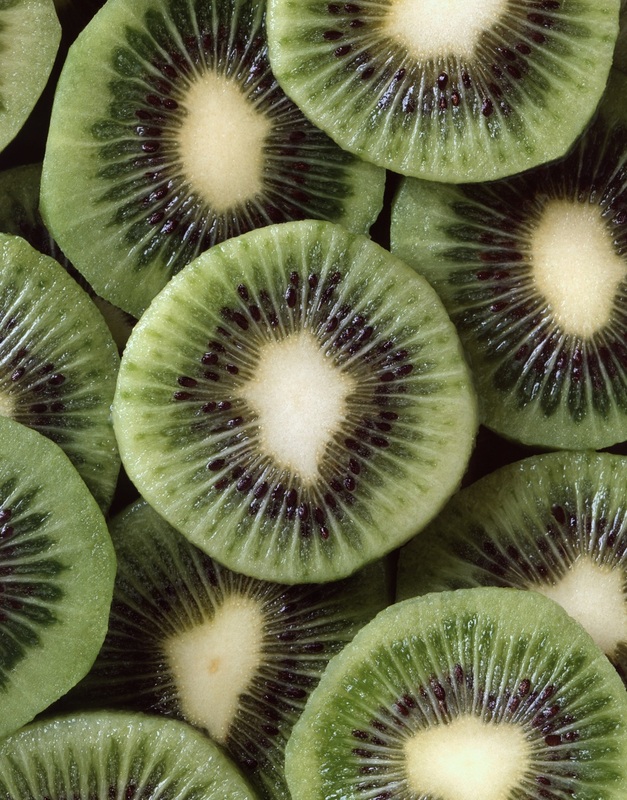 Next, slice the kiwis in fourths, length-wise, and then slicing about ¼ inch thick all the way down. 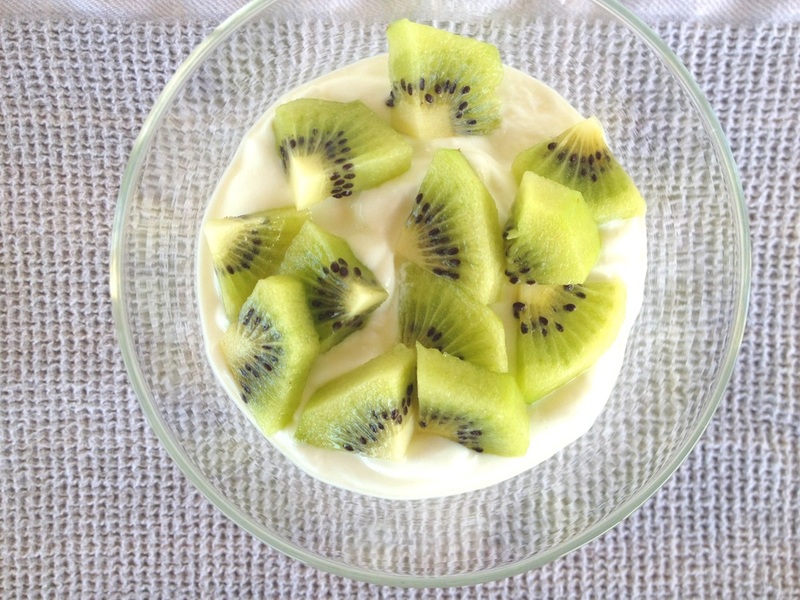 Each parfait will get about 1 ½ kiwis. Put ¾ of a kiwi down on the yogurt in each parfait, and a fourth of the diced watermelon in each glass. Top this with ¼ cup each of cereal, and ½ T. each of chia seeds. Repeat the layers once more (with the yogurt carefully smoothed over the cereal next), and if you like, add the 1 tsp. syrup or honey on top of each one. Now, destroy the layers with your spoon, getting all the flavors together, and dig in. Or get your parfait on however you like – there’s no wrong way to eat a healthy parfait!